Michael WilsonWith all respect to the albums that came before and those that came after – Southern Rock Opera included – history will probably hold the Drive-By Truckers albums recorded between 2003 and 2006 with Jason Isbell in the lineup – Decoration Day, The Dirty South, and A Blessing And A Curse – as the band’s finest, at least on a song for song basis. 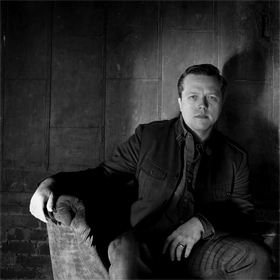 Isbell’s more personal, human-scale songs were the perfect foil to Messers Hood and Cooley’s Southern mythology epics, and his melodic contributions – his songs were arguably the most pop the Truckers ever put out – are still missed years after he left the band to go it solo. A solo career that’s turned out a goodly number of albums, both live and studio, and whose number will increase by one with the release next week of Southeastern, the first record to be credited to Isbell without his band The 400 Unit since his 2007 debut, Sirens Of The Ditch. Which isn’t to say that it represents a dramatic shift from its predecessors, but being a little less plugged-in and more thoughtful in pace, it’s different enough that the change in branding probably makes sense to those involved. The 400 Unit will be on hand when Isbell takes to the road in support of the record, though, an itinerary which brings them to Lee’s Palace on August 2, tickets $17.50 in advance. There’s a feature interview and advance stream of the new record at MTV Hive, and extensive profiles at both The New York Times and The Wall Street Journal. Though he’s proven he can sell out four nights at The Sound Academy, Toronto R&B star The Weeknd is keeping things small to preview material from his new record Kiss Land, due sometime this year; he’ll be at The Mod Club on June 13, tickets $40 in advance and probably sold out already. So the good news is that Still Corners’ NXNE showcase has been confirmed, their continued absence from the schedule until now being a bit of a concern. The bad news is they’re on at the exact same time as The National – 10PM on June 14 at The Horseshoe. Which may not be bad news for you if you weren’t planning on being at The National or were going to see them a couple nights earlier on June 12 supporting CHVRCHES at The Hoxton, but we’re not talking about you, here. Try to keep up. Lemonheads leader Evan Dando has been added to this year’s NXNE lineup; he’ll be anchoring the showcase at The Rivoli on the Saturday night, June 15. If you were wondering who’d step in for the injured Big Boi at NXNE’s closing Sunday night gala at Yonge-Dundas Square on June 16, wonder now more – it’s Ludacris. Who, apparently, has a bunch of chart-topping platinum albums and a starring role in the Fast & Furious films. I had no idea. Still don’t. Because sometimes you just can’t look away – Courtney Love will be playing solo and Hole-less at The Danforth Music Hall on July 20. Expect to pay $35 to $50 for the experience. Bust has an interview with Love wherein she insist she’s sane. Because that’s necessary. With their new record Stills set for a July 16 release, Chicago noisemaker duo Gauntlet Hair have made a date at The Drake Underground on August 5. Consequence Of Sound has the full tour itinerary and the new video from the new record. Chicago indie-rock veterans Joan Of Arc are coming back to town for a show at The Garrison on August 22, tickets $12.50, as part of a tour behind their new record Testimonium Songs, which is out July 11. Washed Out – whose Ernest Greene would probably prefer not to be known as the guy who did the Portlandia theme but whom you probably know best as the guy who did the Portlandia theme – will release his second album Paracosm on August 13 – there’s a trailer below – and who will be touring behind it, the Toronto date coming September 15 at The Opera House, tickets $20 in advance. Veteran Anglo-Dutch experimental rock outfit The Legendary Pink Dots are coming to town, ostensibly in support of their new album The Gethsemane Option – out June 25 – but more likely to explore many corners of their 30-plus year history. They’re at Lee’s Palace on September 23, tickets $20. The Jerusalem Post has an interview with the band. With the August 27 release of Carrier creeping ever-closer – okay, not THAT close yet – The Dodos have made a date at Lee’s Palace for September 24, tickets $17.50 in advance. Welsh meat-and-potatos rockers Stereophonics have figured their latest album Graffiti On The Train has done well enough at home to justify a North American release – it’s out August 20 over here – as well as a tour; look for them at The Danforth Music Hall on September 25, tickets $36.50 in advance. Completing what I will call the live music hat-trick – which for these purposes is playing three shows in a year in ever-larger venues – Britain’s Daughter are coming back to build on last October’s debut at The Drake and this past May’s show at The Great Hall with a performance at The Phoenix on September 29. Tickets for that are $20.50 in advance. Hot on the heels of yesterday’s announcement of their third album Big TV coming out August 21, White Lies have announced a North American tour that brings them to The Opera House on October 1, tickets $25. Anyone wondering why UK buzz band Peace abruptly disappeared from the NXNE listings now has their answer – they’ll be supporting Two Door Cinema Club on their just-announced tour, which puts them at The Danforth Music Hall on October 15.